Do you get Mo Shark shards when forging one shark into another or is it the same amount as Forging with regular bots? I wish I had kept numbers, unfortunately I didn't, but you get roughly 4x the shards (between 3-4x I think) for forging a shark as far as shards. As far as forge level bonus for the guy you are feeding, it exists but not as extreme as 4x, I'd say 2x eyeballing it. 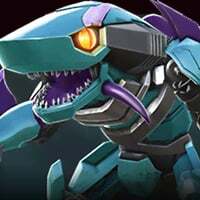 Example.. my 4* galvatron got 25 forge levels for eating my 3* demo shark, whereas he'd have gotten 21 for eating a way better developed 3* galvatron. Also the PI was not even 1k for maxed 3* shark (Sig 10 forge 20 something), pre 4* at least they don't strike me as useable so much as intended for a forge bonanza in the first place.